Check out iMobie iPod Wiki, including the up-to-the-minute iPod news, in-depth iPod reviews, iPod rumors, and resourceful iPod how-to tutorial. Want to transfer 7000 songs from iPod to computer in 20 mins? Start download now before reading this iMobie iPod Wiki page. The iPod is a line of portable media players designed by Apple Inc. The current versions of iPod: the ultra-compact iPod shuffle, the compact iPod nano, the touch screen iPod touch, and hard drive-based iPod classic. Apple's iTunes software (and other open source software) can be used to transfer music, photos, videos, games, contact information, e-mail settings, Web bookmarks, and calendars, to the devices supporting these features from computers using certain versions of Apple Macintosh and Microsoft Windows operating systems. 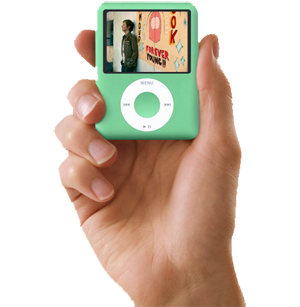 Prior to iOS 5, the iPod branding was used for the media player included with the iPhone and iPad, a combination of the Music and Videos apps on the iPod Touch. As of iOS 5, separate apps named "Music" and "Video" are standardized across all iOS-powered products. While the iPhone and iPad have essentially the same media-player capabilities as the iPod line, they are generally treated as separate products. In the last few years, iPhone and iPad sales have overtaken those of the iPod. iPod is the best MP3 Player I've ever used! I am neither a Mac owner nor an Apple customer in general, but the iPod management software is intuitive and installs and functions well on Windows 7. Although the software will prompt you to register your device and create an iTunes store account, these actions are unnecessary to utilize the device. It is completely possible to purchase your MP3s from elsewhere (i.e. amazon.com) and transfer these iPod songs into iTunes, wherein you can transfer them onto your iPod. The storage capacity is unparalleled by any other mp3 player. I have nearly 5000 songs on mine and still have over 114GB available. The device itself is slim and not too heavy at all. I highly recommend this player! How to Get Music off iPod touch - After reading this tutorial, you will find a good solution to get music off iPod touch. Copy Music from Computer to iPod - Want to learn about how to transfer and copy music from computer to iPod without iTunes? PodTrans Pro is the best answer. Back Up and Recover iPod Music Files to iTunes Library - Any crash on iTunes library could be a disaster because this data base may contain a huge amount of media files. So How to back up and recover iTunes library from iPod? How to Recover Music from iPod to Computer? - One day, if your computer hard drive is damaged or reformatted, then you probably need this How to Recover Music from iPod to computer guide.